Gone Home is a "story exploration" game from The Fullbright Company which takes place in 1995, and stars Samantha, a teenager "dealing with tons of uncertainty, heartache, and change." Riot grrrl is an often misrepresented '90s feminist punk rock genre. 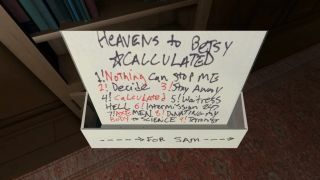 Well then, how appropriate that the latest Gone Home trailer introduces music from riot grrrl bands Heavens to Betsy and Bratmobile as a plot element (and also really great). "In the game, Sam is introduced to Riot Grrrl music by a friend, and it changes her life," said Fullbright Company co-founder Steve Gaynor. "It's really goddamn amazing to have the opportunity for this music to be in Gone Home," he continued. "Authenticity is our number one priority, and the inclusion of tracks by Heavens to Betsy and Bratmobile really drives home the era and the place and the feelings surrounding the story of Gone Home. We're psyched." The trailer features Some Special by Bratmobile, but there are five more tracks in the game, a mix from the albums Calculated by Heavens to Betsy and Pottymouth by Bratmobile. Gone Home will be out the second half of this year, and is a finalist in the Excellence in Narrative category at the 15th Annual Independent Games Festival , happening next week at GDC.